Dysfunctional is only the beginning when it comes to reporter Camille Preaker’s family. When her boss sends her back to her hometown to cover the story of what seems to be a serial killer she is also forced to deal with her own past. Wow! If you have not read Gillian Flynn’s debut novel yet, I highly recommend it. It won two Dagger Awards and was also an Edgar nominee for Best First novel. Libby Day’s mother and two sisters were murdered when she was only seven years old. She testified that her brother Ben, fifteen at the time, was the killer and he has been in prison ever since. But was he the real killer? I made the mistake of starting this novel late one evening and I paid for it by having nightmares all night. This is another homerun for Gillian Flynn. 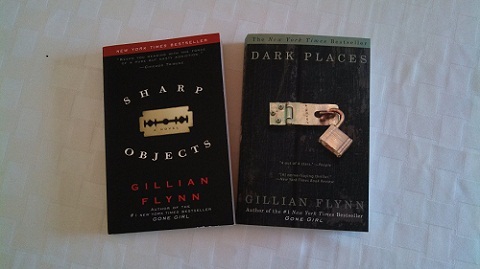 Gillian Flynn is definitely own of my new favorite authors. I read her latest novel Gone Girl a few weeks ago and it was brilliant, maybe the best one yet. The author does not sugarcoat anything and in all of her novels we are constantly reminded that both girls and women can be bad. It is refreshing that each of her novels is stand-alone and not part of a series, unlike so many other crime fiction novels these days. The movie rights have been sold for all of Flynn’s novels and I cannot wait to see how they will translate into the big screen.